When thinking of Venice, the first things that come to mind are canals and gondolas. The ultimate appeal to romantics visiting Venice is a gondola ride with a singing gondolier showing you his beautiful city. Gondolas became the main way to get around the islands of Venice when horses were outlawed on the streets around the 14th century. At one point in time, there were over 10,000 gondolas in Venice. Today only about 500 gondolas remain and they are used primarily for tourists. It is easy to find gondoliers hawking a ride through the many canals. Gondola rides are not cheap, although the rates are officially set. The rides are about 40 minutes long and if you negotiate a better rate, the length of the ride will be reduced accordingly. 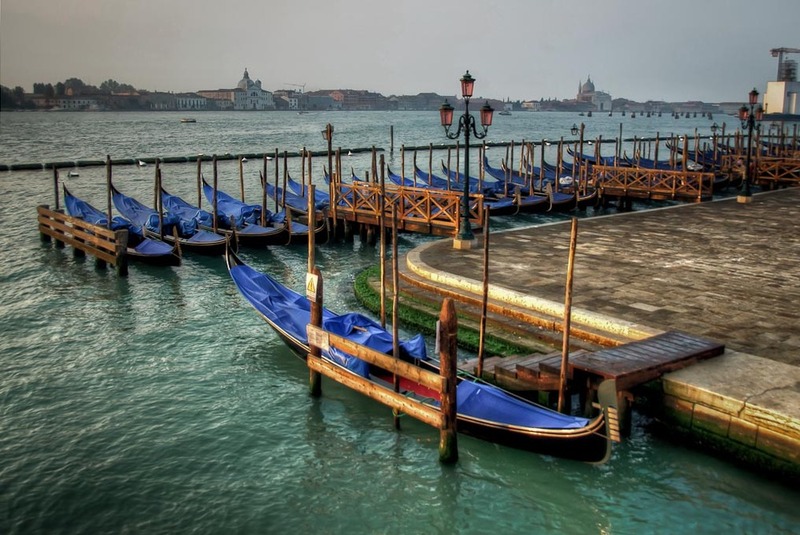 This image of gondolas was taken early in the morning before the crowds descended on St Mark's Square. It is one of the few times during our visit that you could find them unattended without crowds milling about.